It’s like a badge of honour. If we’re not busy, then we’re wasting time, right? It’s easy to get caught up in being busy, forgetting where the time has gone. Imagine discovering one day that everything you’ve been doing you didn’t enjoy! That’s exactly what happened to Jackie. When I met Jackie she was using Personal Kanban™ for a few weeks, and feeling good about the amount of work she’d gotten done. The board helped her to stay focused on what needed doing, and avoid forgetting important tasks. Then, everything changed with one simple question – what was satisfying about her accomplishments? Satisfying? Jackie hadn’t thought of evaluating her work in this way. And now, because all her work was visible on the board, she had the means to do so. Looking at her board, my eyes were drawn to one area – the Done column. Her Done was overloaded with stickies, perhaps 50 or more. She was getting lots done, but she didn’t know what to do with her tasks once they were completed. This is a common scenario, unfortunately. We get caught up in the act of doing and miss out on improving what we choose to do and how we do it. We settle for being busy, even productive without considering the value of our time invested. What was frustrating or disappointing? What did I avoid doing? At first Jackie wasn’t sure what to do, as if she didn’t have permission to consider these questions. After all, this was the work she simply had to do, what did it matter if some of it was enjoyable and some of it wasn’t? Then, as she looked through her completed work she was disturbed to discover that there wasn’t one task she had done in all that time which she particularly enjoyed. Knowing this now, Anna saw her work in a new way. It wasn’t okay to just “do work”. She wanted satisfaction, a greater sense of joy and now she had a way of knowing what part of her work really meant something to her. That was a big aha moment! We made one adjustment to her board. We divided her Done column into 3 categories: satisfying, average and unsatisfying. Now as she completes her work she can evaluate how she feels about it in real time h. She can instantly see the pattern of her finished work and choose to do something about it if she wants to. Now her done work has an influence on what she chooses to do next. It’s not just about being productive anymore, she’s choosing to bring more joy into her day-to-day work life. We do our best work when we have motivation. 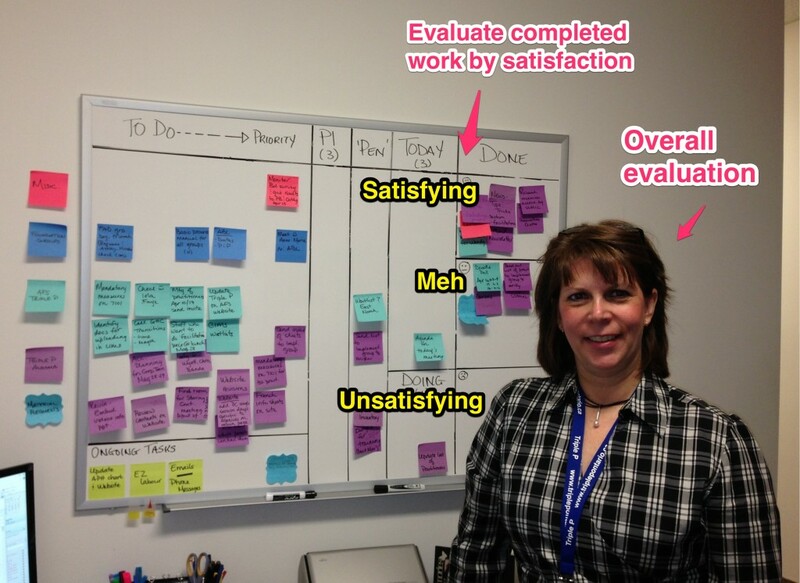 Use Personal Kanban™ to gather data on how you feel about your work. Adjust your Done column to make it easy to see patterns. Do regular reflections on your work. Don’t settle for being busy. Move towards doing more of what you love. What are your tips and thoughts? Share them in the comments below. 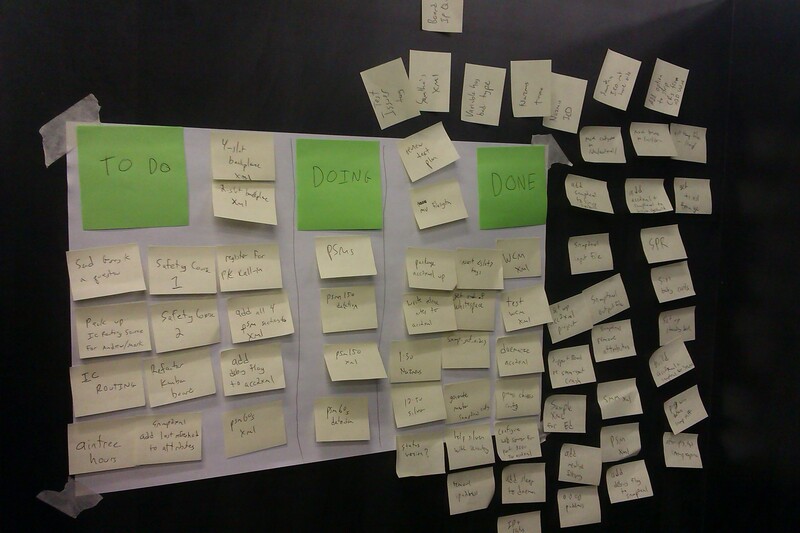 Are you new to Personal Kanban™? Anyone can use it. Here is an intro to Personal Kanban by Jim Benson and Tonianne DeMaria Barry, creators of Personal Kanban and some simple steps to get started.